"Coaching is about being true to yourself and effective with others." Lucie has spent her professional career in the financial and business sectors. 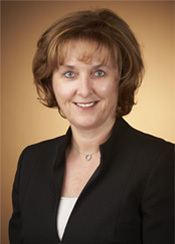 Over the course of her career, she worked for numerous major corporations including the Canadian Department of Finance, the Royal Bank of Canada, the National Bank of Canada, as a partner for the investment fund NB Capital Partners and as vice-president- corporate finance for the Caisse de dépôt et placement du Québec. Since 2001, Lucie has been working as a consultant to business leaders, advising them on both corporate and personal strategies. She joined CDC Coaching in 2004 as an executive coach. In 2009, she launched her own coaching firm, Unix Coaching. Lucie has worked in Montreal, Ottawa and Toronto, and provides coaching in either French or English. Lucie is as comfortable with senior managers and executives as she is with promising younger managers. As the mother of three young adults, she has made it a point to develop a solid understanding of the challenges companies now face in managing high potential young employees. Unix Coaching specializes in executive coaching and coaching of high potentials. Lucie is a lawyer, holds an MBA from McGill University as well as a Minor degree in psychology from the University of Montreal. She is a certified coach at the Master level (MCC level) from the International Coaching Federation as well as a full member of the Worldwide Association of Business Coaches. She is also the Chief mentor of the Mentoring committee of the Quebec Financial Women Association. For a fourth year, she is a facilitator for co-development groups as part of the “Maitre de votre carrière” program of the Quebec Bar. Since 2015, Lucie sits on the steering committee- Women in Technology Mentorship Program- of the Quebec Technology association (AQT). She sat for nine years on the board of the Fondation Marie-Vincent, a non-profit organization for children victims of violence and for four years on the board of Tel-Aide, a non-profit organization providing a telephone listening service for people who are experiencing difficult times. In 2017, Lucie received the Inspiration Award presented at the annual AFFQ Gala.